Atri Hatef had the opportunity to curate an exhibition of art objects from across the world. She says directly manipulating the objects was a totally different experience than reading about them in books. 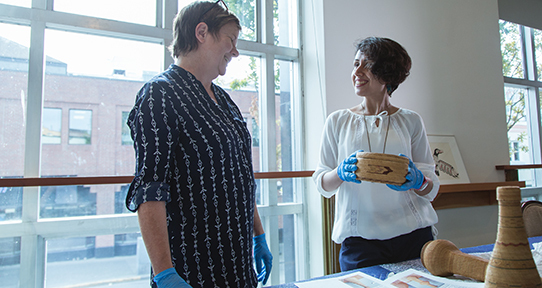 She is pictured here at the UVic Legacy Art Galleries with Caroline Riedel (MA 1997), curator of collections, handling Nuu-chah-nulth basketry covered bottles from the late 19th/early 20th century (unknown artists). Immerse yourself in your art history research and explore topics you are passionate about alongside expert faculty members. In addition to opportunities for teaching and research assistantships, internships, co-op education and travel funding, our graduate students have their own study space close to faculty offices and a near-by coffee shop in the Fine Arts Building. For admission to the MA and PhD programs in Art History & Visual Studies, students need to have a solid background in academic Art History/Film Studies with a minimum of 6-8 courses covering various chronological periods and geographic areas of Art History/Film Studies.